A 27-year-old man has died after he suffered fatal injuries in a scrambler crash in Lisburn yesterday evening. An ambulance was called to a lane close to the Sprucefield park and ride facility around 7pm last night following the incident in which an 18-year-old man was also hurt. His injuries aren’t thought to be life threatening. The dead man has been named as Ryan Phillips who was from the Lisburn area. Last night’s incident came just days after a black taxi advertisements aimed at tackling the scourge of scramblers had to be scrapped because of complains from Republican Network for Unity (RNU). The party – who have in the past sent fraternal greetings to outlawed armed group Óglaigh na hÉireann at their annual Ard Fheis – hit out at the campaign online and called on black taxi bosses to withdraw the ads from their vehicles and claimed that drivers were being “forced to advertise the PSNI” on their vehicles. The campaign was launched in the wake of the tragic death of local mother-of-three Valerie Armstrong who was hit by a scrambler in Colin Glen Forest Park last July. In a lengthy post on Facebook, RNU called on black taxi bosses to withdraw the ads from their vehicles and claimed that drivers were being forced to “advertise the PSNI” on their vehicles. 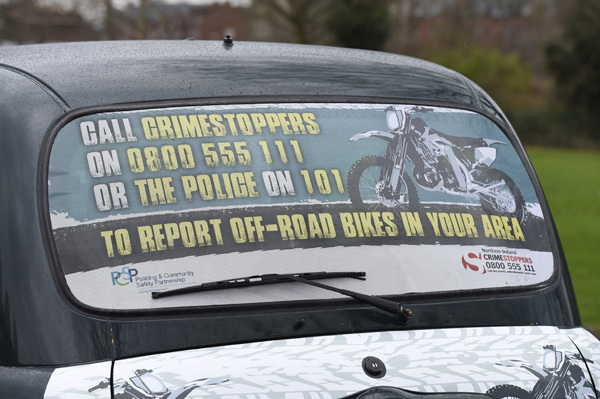 Amid a growing number of incidents involving scramblers the PSNI have stepped up efforts to seize the vehicles which are often unlicenced for the road and uninsured. In December police in North Belfast used the PSNI helicopter to pursue two men on a quad bike that was confiscated. Stormont has debated new legislation that would stiffen penalties for those caught riding the vehicles.